Director/Visual Effects – Drew Casson, Screenplay – Drew Casson & Jesse Cleverly, Producers – Miles Bullough & Jesse Cleverly. Production Company – Wildseed Studios. Chloe Murdock celebrates her sixteenth birthday. She is given a videocamera as a present and starts recording everything. There are then reports of an explosion near Hungerford and panic on the news. Chloe’s mother goes to work but fails to return. Next there are images on the news of alien ships attacking London. The military orders an evacuation of the area just as one of the ships attacks nearby, during which Chloe’s father is killed. 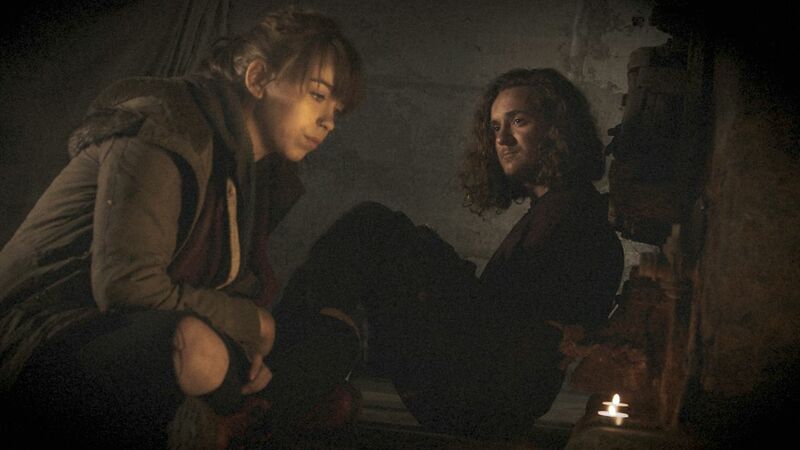 Chloe and her older sister Sam are offered refuge in the tunnels with Bob who then starts to acts possessive of them. They leave Bob and join three armed men led by Cowen Rosewell as they head to a military encampment in the Manchester area in search of one of the other men’s sister. This takes them on a journey across countryside that has been devastated by the attack and into encounters with dangerous survivors. The Darkest Dawn was the second film from British director/actor Drew Casson. Casson had previously made Hungerford (2004), another Found Footage film about a zombie outbreak. In the film here, Casson can also be spotted playing the curly-haired leader of the group of men that the two sisters join on their cross-country journey. The Darkest Dawn has the novelty of being the first Found Footage alien invasion film. We have had a few examples of the Found Footage UFO encounter film such as The Encounter (2015) and The Gracefield Incident (2017), which can be considered alien invasion films that take place in an isolated locale. The nearest thing we have had to a widespread example before might be Cloverfield (2008) but that left so few clues about its monster it could be anything. (As with many of these Found Footage films, it appears to be filmed with a magic camcorder that has endless batteries that allow the characters to keep filming for weeks after civilisation has collapsed even when there would surely be no power available for recharging). Drew Casson is another of a new generation of British genre directors who have taken their lead from Gareth Evans and Monsters (2010) and produced all the visual effects themselves. Casson’s work here contain some impressive shots of planes coming down (although leaving far too little devastation for an explosion that occurred only a few blocks away), of alien ships overhead, buildings collapsing and a devastated countryside. The Darkest Dawn is not a great film but Drew Casson does deliver some moments of effectively harsh survivalism – the slightly absurd scene where Casson and Tom Scarlett fight over Scarlett taking the apple belonging to the old man sitting by his wife’s deathbed; Scarlett shooting a wounded woman they come across in the woods because they can do nothing for her; the group answering a kid who begs for help only to be taken prisoner by a group of men and Bethan Leadley savagely stabbing of the leader (Paul Neafcy) as they get free. Drew Casson mounts the show to a vigorous shootout climax amid the appearance of the alien ships.